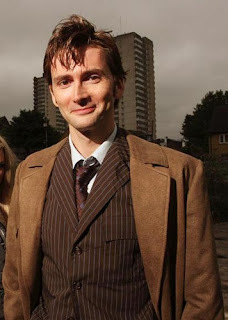 Home » david tennant , doctor who , science fiction , television » David Tennant quits DOCTOR WHO! David Tennant quits DOCTOR WHO! David Tennant, whose madcap mixture of deadly seriousness and clownish buffoonery endeared millions to his portrayal of the Doctor on Doctor Who, is leaving the show after three seasons, it's being reported tonight. Tennant will remain for four upcoming Doctor Who specials, including the now-traditional Christmas special, which were already scheduled in lieu of a regular season for the show in 2009 (in order to accommodate the sellout performances of Hamlet that Tennant has been enjoying on the London stage). But after that, at the end of 2009, expect Tennant's Tenth Doctor to regenerate and another actor - the eleventh since the show began in 1963 - to take over the role. It will also coincide with the beginning of Stephen Moffatt's reign as showrunner. As an aside, I'm starting to understand what it's usually like for a Doctor Who fan to have the departure of a Doctor happening on a semi-regular basis. First it was Christopher Eccleston a few years ago, and now Tennant. But as the Doctor would be the first to note, change is the one universal constant, is it not? Okay so... anyone wanna guess who'll be the next to pilot the TARDIS? It's sad to see David Tennant go. I hope that the next guy that plays The Doctor stays for a long while seeing as how he'll be the Eleventh Doctor, and that means The Doctor only has two regenerations left, unless the Time Lords gave him more regenerations at the beginning of the Last Great Time War. I've enjoyed Tennant's run. He and Tom Baker are 1 & 2 on my favs. I really hope they choose a good new doctor. Truth is...those who portray The Doctor are all from within a box. A quite large box, mind you, but a box nonetheless. And NO ONE thinks outside of that box. "1) Someone older than age 40"
I have heard a LOT of people very seriously suggest that Tilda Swinton could portray the Doctor. And I'm hard pressed to disagree: that woman could play ANYTHING. "3) Someone of African descent"
Would be different, but I think a lot of Doctor Who fans would accept someone of African heritage (at least one such actor is aleady being rumored, but I forget his name at the moment). "4) A Kaled (mutant or otherwise)"
"5) Someone that looks like you and me"
Wait a sec... you mean you DON'T look like Jon Pertwee?!? And *I* don't look like Colin Baker either?! ?